Model 013 of the Dojo Pro series features a heavy, solid iron tsuba that evokes the feeling of strength and power from a massive tree deep in the primeval forest. 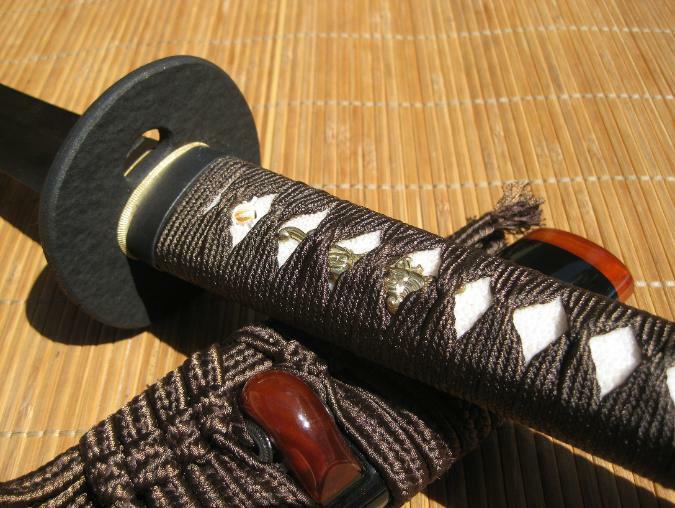 As you can see from the picture, these swords feature high end brass seppa (spacers) and habaki (blade collar), and the saya is strengthened with rich cholocate brown buffalo horn caps (Kurikata, Koguchi and Kojiri) with a red undersheen that appears in direct sunlight. I have been eyeing many Ronin Dojo Pro Katanas for about 1-2 years. I have bought from Roninkatana's scratch n' dent sales for the dojo pro lines. They are amazing I must say. So with that being said...I have handled the Dojo Pro Ko Katana Model #1, Model #3 Classic "Tsuru" and Model #15 KoBuke. I wanted this one Model #13 in particular due to the fact I have seen no reviews so I am happy that I get to be the first. I am no sword expert...I just know a couple things that I have spent extra time researching different swords and the specs that comes along the way. I have little experience in swords I only practice little bits and pieces of what my Master from Taekwondo has shared with me and which he has experience in Hadong Gumdo a Korean sword Martial Art as a 4th Degree Black Belt. I apologize I have no other review posted in other sword forum sites so no pics just a bit of detail from my short review here on SBG. Maybe in the near future I will post a better detail review with pics of this great sword. -Silk Ito lookes greats but most of all it feels very comfortable and does alternate. -Kashira, Fuchi and Tsuba are all blackened iron; it is well built and sturdy. -Tsuba is simple yet elegant and unlike its other Dojo Pro brethren...the inside edges of the Tsuba are not sharp. I heard a review of a guy getting the Model #4 Dojo Pro of him getting his thumb cut from the edges inside the Tsuba and was bleeding. So instead the Tsuba on this one is rounded and feels comfortable. Kinda reminds me of Rurouni Kenshin, most of the characters in this anime who used swords had this kind of shaped Tsuba very plain and simple but I dig it. -Seppas, habaki, and menuki are all brass and is nice. Most notably the Habaki because it has a more neater design that the plain boring. -Buffalo horn fittings DEFINITELY caught my eyes big times. They are translucent and looks very nice. But looks aside practical wise they are great for sayas for enhanced reinforcement. 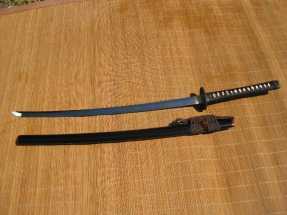 -Sageo feels great it is synthetic silk but it aint cheap and lacy it feels nice and is durable I believe unlike other cheapo production katana-like types I have owned this is wayyy better. -The blade fits snuggly inside and no space from the koiguchi and seppa in mine. -Also, the blade is easy to draw out; especially with just a simple push with the thumb and it comes out comfortable. -(?) Waxy residue in saya for transport to keep it from rusting. (?) Because I think it is a Pro and a Con due to the fact it was for intention to keep the blade in good condition during transport for the customer and Con because it stays there for awhile and will keep coming onto the blade when drawing and unsheathing it, but it does come off over time as I have seen from other Dojo Pros...So no worries really. Conclusion: Awesome sword overall really and as you can see that the Pros totaly outweigh the Cons. There are reviews by other people saying it cannot handle bamboo which is totally not right... I have been waiting patiently for this sword and been wanting a Ronin Dojo Pro for myself and in new condition. I actually gave away all the other Ronin Dojo Pros from which I got scratch n dent sales from Roninkatana. The Ko Kat to my girlfriend which she totally digs, Model #3 Tsuru to one of my bestfriends which he always wanted a Dojo Pro and he loves it, and Model #15 KoBuke to my older bro which he loves too as well. 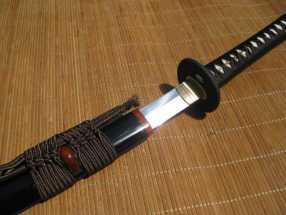 I tell yeah that you won't be disappointed with these katanas you will appreciated the fittings and the blades. They cut well I have cut with them on typical backyard tameshigiri:(All water filled) bottles, plastic cartons, half gallon cartons and 3-4 gallon containers. These are exceptional blades. There are many reviews on the Dojo Pro line go get one! :D SBG has good Customer Service and their Sword Guide is awesome.